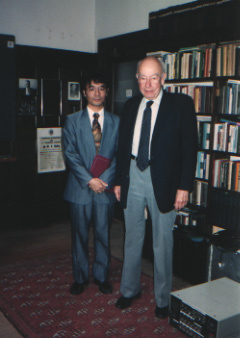 This interview was made between Prof. W. V. Quine (Harvard University) and me in May and June of 1992 at 201, Emerson Hall, Harvard. Its Japanese translation was published in Shiso (Tokyo: Iwanami Shoten), No. 825 (1993): 4-30, and later it was included in my [Quine and the Contemporary American Philosophy] (Kyoto: Sekaishisosha, 1994), pp. 4-51. I am grateful to Harvard-Yenching Institute for accepting me as one of the visiting scholars 1991-1992, and providing ideal circumstances for making the interview. I am also thankful to my wife, Yoko Tomida, for helping me provide the text for the following pages. Tomida: In his "Empiricism, Semantics, and Ontology" Professor Carnap explicitly made a distinction between "internal questions" and "external questions." This distinction was based on his view concerning meaning and analyticity, and the latter was, together with his outlook on ontological commitment, clearly opposed to your idea which is typically shown in your very influential article, "Two Dogmas of Empiricism." According to Carnap, our questions concerning the existence or reality of entities can be clearly divided into two groups -- external and internal questions -- and while the former are concerning the matter of acceptance of some linguistic framework, the latter are questions of existence within some framework. To accept a linguistic framework is usually to adopt a cluster of logical principles and some "meaning postulates." So, for Carnap, this also meant an acceptance of a cluster of analytic truths. Moreover, the adoption of a linguistic framework is, according to him, not based on any belief on the structure of reality. It is merely a matter of decision which is to be made from a pragmatic point of view. Thus the difference between Carnap's and your philosophical positions is clear. First, according to your view, Carnap's distinction between external and internal questions is based on an ill-conceived idea on meaning and analyticity which should be repudiated. Second, his distinction prevents him from accepting a thoroughgoing holism, and his pragmatism seemingly goes only halfway. And my question I should like to ask you today is: Why did Carnap persist in the distinction between analytic and synthetic truths? In other words, why did he stop just before the fourth milestone of empiricism? And, maybe we don't need any explanation about the term, "fourth milestone." Tomida: And, please give me a little more time, because this question of my own is, in a sense, very simple, but there are some reasons why I myself now ask this question. And so I'd like to explain the context of this question a little bit more. Tomida: One of the reasons I ask such a question is that in spite of Carnap's persistence in the distinction in question, I mean the distinction between analytic and synthetic truths, and also the distinction between internal and external questions, in spite of this persistence, Carnap had already almost reached the fourth milestone in his Logical Syntax of Language. If this statement of Carnap's is correct, it also means that there is no strict difference between analytic and synthetic truths, nor is there any strict difference between external and internal questions. But, as you know, Professor Carnap didn't refuse the two distinctions, namely, the distinction between analytic and synthetic, and also the distinction between internal and external. And here I have several data, several quotations from your own books and also from Carnap's articles. And, judging from them, I don't understand why though your position and Carnap's position are overlapping in this respect very much, Professor Carnap didn't refuse the distinctions, namely, he wanted to keep it. So, and also I know from your autobiography, that the controversy between you, Tarski, and Professor Carnap began in 1940, and it continued more than ten years. So, if I could hear the content of the discussion, or the content of the reason why Professor Carnap kept the distinction, I'd be glad. Quine: Yes, I would too. It's a mystery to me. All that about holism which you read from Carnap fits so exactly my own position. And so in view of that, I agree, it's hard to understand how he could adhere to his old dichotomy. I felt that two reasons why he thought that the notion of analyticity was important had to do with his philosophy of mathematics. Mathematics, according to Carnap, is without empirical content. And so, according to his empiricist position, it ought to be meaningless like metaphysics. But it isn't meaningless, and it's very useful. That's one problem. And another problem is that mathematical truth is supposed to be necessary -- mathematics is necessarily true. And both of these are explained, from Carnap's point of view, by analyticity. Mathematics, being analytic, is without empirical content, but still analytic truths are needed. They're essential in organizing science. And their analyticity explains also why they're necessary. And second, the question of the necessity, also, is cleared up by holism, in this way. In view of holism, as Carnap says in that part you read, we have a choice where there is an unexpected experimental result and we have to change the hypotheses; we have a choice as to what hypotheses to change. And so, we always choose to preserve the mathematical ones. We have to choose and we do choose, we choose it because we don't want to disturb the overall scientific edifice more than we can help. So this is why I say the holism eliminates the utility of analyticity, at least in its applications to mathematics. However, it remains mysterious to me as it does to you why Carnap didn't see this. Well, he might not have seen these arguments from holism about mathematics; that may be a part of the explanation. But on the other hand, all that you read, there, I was quite impressed. I had forgotten how much there was of this in Logical Syntax ; there is so much like what I tried to persuade him of. And I had noticed that, I mentioned somewhere that, yes, Carnap gives lip service to Duhem and to holism, but he doesn't draw the moral. He doesn't draw the consequences of holism that he showed. And so, that is a mystery why he doesn't draw the consequences because he has here about a page that you read from Logical Syntax, that is exactly the sort of things that I've been arguing against him. So this is very puzzling. Quine: "Two Dogmas." Yea, that's right. One year before. A year and half before my lecture, "Two Dogmas," which was December 1950. This was August 1949. My wife and I and a friend were driving back from California, and stopped and visited Carnap and his wife in New Mexico. And there again I was arguing with Carnap about analyticity. Forty nine. But still no progress. Yes, it's very strange. Very Strange. It's as if he had two compartments in his mind. Tomida: In Japan, several younger generations of philosophers who are much interested in the history of analytic philosophy are very much interested in this phenomenon. Many people know that you and Professor Carnap had a very close connection, in a sense of official and private life. And also sometimes Professor Carnap's writing shows that he could accept your position, but sometimes, he strongly refused your position. Quine: Yes, but still it remains puzzling. Because in what you read of Carnap's holism, he also said that even mathematics and logic could be changed. But, what one is left wondering is once Carnap has recognized all this that he has recognized regarding holism, what is the analytic/synthetic distinction accomplishing? Because it seems that he can say the same thing on both sides of the boundary. In the framework you can change things as needed; on the other side of the boundary, on the empirical side, you can change your theory here, or here, or here, in order to accommodate the protocol sentences. So, the distinction seems to become a distinction in name only, besides which it isn't drawn. Yes, that's very striking. I think that's very much worth bringing out, bringing these things together explicitly. Quine: As far as I know, yes. Of course, in his later years, he was occupied completely with his work in confirmation, induction, probability. And, I don't know, I never got into that deeply, I never studied it properly. But it may be that the notion of analyticity just didn't function, just didn't operate. So, it may be that he was no longer concerned with the question. Tomida Ah, so you mean that ... fifties or early fifties...? Tomida: Now, I'm reading the book. It's very interesting. Tomida: And also I didn't know that you were an artist. Quine: Oh, yes, well, I haven't done much of that. Let's see. Ah, I think I've done it. Yea. Yes, 1951, the year of "Two Dogmas." "Two Dogmas" appeared in January, fifty one. Quine: Yes, I went to a meeting, the Carnap seminar in Chicago that spring, the spring of fifty one. So, just a couple of months after "Two Dogmas" came out. So, we were arguing then about ontology, and that was connected, in the way that you suggested, with analyticity. Quine: They are, because the point was that in ontology he wanted the distinction between ontological questions that belong to the framework, the existence of the physical objects for instance, and ontological questions that belong to science proper, such as the existence of unicorns, and the distinction between framework and empirical science in turn, is the distinction of analytic/synthetic. So, there's a connection, yes. Tomida: If the history of Western philosophy since Aristotle could be called a series of footnotes to Plato's philosophy, then in the same sense some outstanding philosophical movements after the 1950s would be reasonably called a series of footnotes to your philosophy, as witness Donald Davidson's and Richard Rorty's. Indeed, both of them have their own subject matter, but some crucial ideas of theirs had already been espoused in your writings. For example, Richard Rorty is a well known philosopher who de-transcendentalized philosophy, namely, deprived philosophy of purported privileged absolute knowledge, and on the basis of it he emphasized human creativity. Sometimes he calls his position "ethnocentrism," in the sense that we have no way other than beginning with what we have now. But this idea itself had already several times been emphasized in your books, and I do not think that Rorty did full justice to this fact, for when he deals with your philosophy of language and science, he treats it merely as a philosophy which offered a powerful weapon against the purported privilegedness of only one kind of "privileged representations," namely "analytic truths." According to Professor Rorty, there are three conspicuous figures in the analytic movement who helped to undermine the traditional empirical standpoint: you, Sellars, and Davidson. His story about the transformation of analytic philosophy goes on as follows: first, you rejected the privilegedness of analytic truths and Sellars attacked "the myth of the given" and eliminated its absoluteness; and finally, Donald Davidson undermined the distinction between scheme and content. This picture is, indeed, fine and clear, but I think that it is in several respects misleading. Have we now so far lowered our sights as to settle for a relativistic doctrine of truth -- rating the statements of each theory as true for that theory, and brooking no higher criticism? Not so. The saving consideration is that we continue to take seriously our own particular aggregate science, our own particular world-theory or loose total fabric of quasi-theories, whatever it may be. Unlike Descartes, we own and use our beliefs of the moment, even in the midst of philosophizing, until by what is vaguely called scientific method we change them here and there for the better. Within our total evolving doctrine, we can judge truth as earnestly and absolutely as can be, subject to correction, but that goes without saying. We know that this is a very famous part in your book, Word and Object, and, needless to say, this is another expression of your fundamental idea sometimes mentioned in terms of "Neurath's boat." What I would like to ask you today is, however, not a question concerning such a relation between your philosophy and, say, Rorty's. What I want to ask you today is a question about your concept of stimulation. And what I have said thus far makes a general context of the question. Tomida: According to your basic idea mentioned above, we can talk sensibly about what "the best [theories] we can muster at the time" speak of as existent. Thus we can freely talk about physical things, for example this desk, today's weather, and our sensory stimulations. So, needless to say, since you are a kind of physicalist and accept contemporary best sciences as well as sound common sense, it is natural that in your philosophy of language and science you mention not only so-called ordinary things but also "surface irritations." Actually, for example, in your arguments on "radical translation" and "evidence" of theory you have recourse to the concept of stimulation, and you identify it with those of "surface irritations," "triggering of our sensory receptors," or "the temporally ordered set of all those of [a subject's] exteroceptors that are triggered on [an] occasion." Certainly, your repeated mention of such stimulations is completely coherent with your basic position mentioned above. But sometimes I feel a kind of uneasiness about your usage of "stimulation." So, I would like to take this opportunity to directly ask you my lingering question about it. Please let me explain my question. The linguist hears 'Gavagai' once, in a situation where a rabbit seems to be the object of concern. Quine: Well, but you see, I'm not calling the rabbit, or the situation, or the weather, or whatever it may be, a stimulation. Quine: Yes, it's a subject matter. Quine: Correct. It is. That's no confusion. Quine: The linguist, I don't know. None, none. It's purely epistemological. It's not linguistic. Not semantic. Tomida: OK. Then, my question will be a little bit clearer. Or my question will be able to be changed into such a form. Namely, what type of relation do epistemology and activities of a field linguist have? When we re-read your writings, we naturally notice two outstanding ideas of yours. One is your idea concerning naturalized epistemology. And the other is an idea concerning radical translation. But, of course, these two areas are, strictly speaking, not different areas, but just one whole inclusive idea of yours concerning human activities or human science. In my opinion, your argumentation about radical translation offers some new perspective. And that perspective has a role to make people take notice of some conspicuous kind of indeterminacy. But, this recognition of indeterminacy has a very close relation to your idea of naturalized epistemology. Don't you think so? Quine: Perhaps not very. Let's take the linguistic situation. The linguist gets into the native language, jungle language, by empathy, into observation sentences. The linguist doesn't think at all about surface irritations. He observes the native, hears what the native says, sees the situation. He empathizes, puts himself in the native's place. Quine: and he thinks, "Now, here's the native looking at the rabbit, and the native is saying 'gavagai'." And the linguist thinks, "Well now, if I were in his place looking the way, in the direction he's looking, I would say 'rabbit'." Quine: And so, that's his conjecture, then, and he'll try it on, on further occasions. And, finally, he'll be satisfied, "Yes," and so he puts that down in his translation. He's not thought about stimulation, not thought. However, perhaps the link is the observation sentence. The observation sentence is important for the linguist, because that is the sentence that can be associated directly with what he sees going on, rather than going to the past, speculating, or investigating the native culture. Quine: So, I think that's the way I look at it. The observation sentence is the link. Then, comes the question: what is special about the observation sentence? And this, then, is a question that one can consider without regard to linguistics, without regard to translation. Namely, what's special about the observation sentence is that it is, or can be, conditioned directly to concurrent stimulation. Tomida: Uniform causal connections? Do you mean the...? Quine: There is presumably a good deal of correspondence between the two. But, that's not what I bring in the surface irritations for. That's simply in order to have something to relate the learning of the observation sentence to psychologically. Quine: That's a psycho-physical mechanism, which distinguishes observation sentences, and here the main focus of that aspect of all of us, the main focus, that is the question of the connection between our theory of nature and nature. One step of that connection is the correlation between the observation sentence and the surface stimulation and other connections, logical connections between other sentences and observation sentences. So, that's the epistemological side. Now, one could, in fact, and Davidson seems to like the idea, even considering the epistemological side, the causal connection between the observation sentences and nature, of considering not the causal change just up to the surface irritation, but all the way up to the rabbit. Quine: Well, and there are practical reasons for not doing it. Notably, observation sentences are not, in general, sentences about dogs, rabbits, milk, mama. No, they are also sentences like "It's raining", "It's getting cold." What are the things? Some people would say "OK, they are situations." But situations for me are an unwelcome reification, because of the problems of individuation. Quine: What is a situation? We can say what an animal is, what a desk is, and so on, what these things are. But we don't limit observation sentences to those. And, in fact, an observation sentence sometimes will be, one of my examples, which is a more sophisticated observation sentence, "There was copper in it." It's uttered because you see the color of the solution. That's something that would be an observation sentence for the chemist who has learned about the colors of solutions. What is the distinctive situation there, you see? Well, you get the sentential characterization of the situation, sentential objects. Quine: It's unnecessarily vague and miscellaneous sort of ontology that you drag in, and you don't need to, because it all gets filtered through the surface. And surface irritations are very neatly classified and it's always just a matter of these or those nerve endings being triggered. The third alternative is to get inside the brain so well. We don't take surface irritations or the rabbit, but we take something final in our causal chain. But, the developments in neurophysiology, neuropsychology these days show that that's really quite a complicated tangle again, of what's happening in the brain, different aspects coming through to different centers. But, at one place where everything is neatly sorted out is the surface. Quine: So, this is just a practical choice. But, translation goes quite independently of that. The reason that there is a bond-link in observation sentences is that, A: observation sentences are the child's entry into language, and also the scientist's check-point. Quine: That's the epistemological side. B: Observation sentences also are the sentences that the translator can get into first, because of the observable correlation between the observation sentences and the environmental events, which they express, which they announce, not which they are conditioned to. They're not stimulations. I mean that's an inconvenient way of construing stimulations, for the reasons I gave. Quine: The indeterminacy of translations, I think, that should all be looked at, not in terms of stimulus meaning, but the thesis of indeterminacy of translation could be put this way. What constitutes a good translation, a good manual of translation, is a manual that facilitates smooth dialogue and successful negotiation. Successful negotiation gets a person to know what he wants or to know what you want, and that's the standard. And you can have two manuals of translation that, the thesis of indeterminacy is just this, you can have two manuals of translation, both of which are equally good, very good, in implementing a successful communication. Quine: But, which are different. In fact, the conflict between them also can be put in this way. It's not just that they give different translations. Because, one of the same manual will accomplish different translations of the same sentence because of equipment. There is a different way of phrasing what you want to say. So, those are all consistent. But the real conflict between two manuals is this. If you use the manuals in alternation in translating, and here you have continuous discourse or continuous monologue or dialogue or whatever you are translating. And you use this manual to translate the first sentence, then this manual to translate the second sentence, alternating this way. The result, that would be incoherent. Quine: That's the sense in which these are incompatible. The result would be a mixed manual, would be a manual that does not facilitate smooth communication. So in this description you see no mention of stimulation. Quine: Well, there's difficulty there, in Word and Object, as I point out in The Pursuit of Truth. Namely in Word and Object I was equating the stimulus meanings between speakers. And at some points I mentioned, I think, the problem and I tried to handle it in terms of homology between nerve endings and subjects. Tomida: When you use the term "homology," you use it as some mathematical term? Or some other type of homology? Quine: The corresponding components adding up to the same functions. And, in this case, homology will mean that for each nerve ending on one subject's surface, there's a corresponding on the other person's surface, such that they are doing the same work. Quine: And, of course, there's no reason to suppose this is true, and it shouldn't matter. And it doesn't matter. In fact you can be pretty sure it isn't true. And it was a bad theory to have anything to depend on that. And, finally, as explained in Word and Object and also in that St. Louis volume, the Perspectives,  I came to realize that this is not needed, and that the correspondence of stimulations is not needed. So, that aspect of Word and Object is obsolete. The way to look at it is truth. Quine: And so, in Pursuit of Truth you don't get any suggestion of the sameness of stimulus meaning between subjects. For Pursuit of Truth, stimulus meaning is private. Tomida: I see. So, wait a minute please. ... We can find in your book, Pursuit of Truth, this passage. My naturalism does allowme free reference to nerve endings, rabbits, and other physical objects, but my epistemology permits the subject no such starting point. His reification of rabbits and the like is for me part of the plot, not to be passed over as part of the setting. Quine: I don't understand. Where is the difference? Quine: What I'm trying to say here is that in describing these things I can make use of any of the scientific concepts that I know, including reference to nerve endings. But, I don't want to assume that the subject has these concepts, the subject whom I'm describing. Tomida: Um. And so, this idea is very coherent with your idea of Neurath's boat. So in this sense, your idea of Neurath's boat is the most basic idea of your philosophy. Can I say so? Quine: Well, I don't know about that. They are on the same footing as the rabbits, I would say. Quine: No, they are all on the same footing. They are on the same footing. The only reason for bringing in nerve endings is homogeneity of reference points. If we see the alternative, if we are out there with the rabbits, there's also the question of observation sentences, like "It's cold." What is the object there corresponding to? In the case of "That's a rabbit," OK, there is a rabbit, related to the observation sentence. In the case of "It's cold," "It's raining," what's the object related? It's not clear. Let us say "situation." It's the unwelcome ontology of assuming situations as objects. So let us assume rabbits. Rabbits are on the same footing as nerve endings. But the point of sets of nerve endings as correlates of observation sentences is that all these various sets of nerve endings are, rather, homogeneous family of specifiable objects, the way the observation sentences are homogeneous family of each one of string of sounds. And, so we can make an intelligible correlation between the observation sentence and a class of sets of receptors. The alternative, to make a correlation between an observation sentence and what, a class of rabbits, OK. But, if it is the observation sentence, such as "it's cold," or some complicated, more complicated observation sentence, a situation or observation sentence, one about a black cat facing a dog and bristling, OK, what's the object this is related to? A cat? Well, a lot more than that. Black cat. That's good so far. More than that. What's the cat doing? There's a dog it's facing and bristling. There is a really complicated object. It is an object. But, on the other hand, all observation sentences can be related, in this very direct way, to the nerve endings. All these causal chains from various objects get concentrated in a uniform way for a while as they go through the surface, and then they branch out again in the brain, and everything becomes complicated again. So the easy place to catch and identify and name and distinguish the causal chains is that surface transition. Quine: Pragmatic, exactly. That's my reason for concentrating on the surface irritations. Yes, pragmatic. It gives you a simpler theory, yes. Quine: Ah, I expect, yeah. I don't use it myself really. Quine and Tomida: "Two Dogmas." Quine: Because there I'm taking the word from Carnap. You see, I'm answering Carnap. Carnap says that the framework concepts, all general or broad ontological ones like reality of physical objects, reality of number, these are decisions which are made pragmatically, whereas, on the other hand, whether there are prime numbers between five and ten, whether there are wombats, whether there are unicorns, these are questions of fact. So he makes the distinction between pragmatic decisions and questions of fact. Quine: That's right. And my objection to Carnap is to the dichotomy which he makes, which is depends on the dichotomy between analytic and synthetic. Quine: And so, in so far as Carnap is using pragmatic considerations down to that point of factual ones, I say, yes, I agree with Carnap. But my pragmatism would go all the way to the bottom. That is, the same kind of considerations are at work early and late, namely, getting the simplest system we can find, the simplest and clearest, that accommodates all our observations. So, my reason for using the word "pragmatism" there was just because it was in the paragraph of Carnap that I was responding to. So I also don't object to being classified as a pragmatist. I'm not sure what it means. What is clear to me is that I'm an empiricist. Quine: I'm a pragmatist empiricist. Quine: It could be. I can't remember. Quine: Well, yes. Let's see. Yes, there's a paper I've been writing now. It's a lecture I gave in Ohio two weeks ago. And I've made some further changes in it since. And I'm going to be giving the lecture again next fall in Montana. And I'm also going to get it typed up, and send it to, I think, The Journal of Philosophy. But, I don't have it here. It's in Boston. But, I can bring it in. There's some pages on just this. Quine: Oh, yes, but you'd have to wait then until it came out, and I don't know when that'll be. So, what I must do is get you a Xerox of that. It's all written out very clearly in handwriting. And so we can Xerox pages for you. It's not here. I'll have to bring it in. I can see you tomorrow some time. Tomida: I think this was very helpful for me to understand your ideas of stimulation and the difference between your idea and Davidson's. But still there remains some questions concerning your idea of stimulation or, in other words, the relation between your idea of stimulation and Davidson's. And so, first I'd like to ask you about the neural intake. So, in other words, tagging of the causal chain. My observation sentences treat of the distal world. and they are rock-bottom language for child and field linguist alike. My identification of stimulus with neural intake is irrelevant to [semantics]. For you, the problem of the tagging is a problem of epistemology, and as you once said in your Pursuit of Truth, " [your] naturalism does allow [you] free reference to nerve endings rabbits and other physical objects, but [your] epistemology permits the subject no such starting point." But, as far as I know, there is no epistemological viewpoint like yours in Davidson's philosophy. Quine: You are right. That's what I tried to say, too. I agree. Quine: Yes, I'm interested in epistemology, and I don't want to finesse the subject's reifications. I want to study how he reifies. Quine: Yes, in fact, I was confused then, I think. I just caught it lately in going over those things, and changed it in this new version. Namely, I had the notion that since I want to study the subject's reification, his gradual step by step, reifying of rabbits and the like. I don't want to assume that he's already done that for start. And, whereas I accused Davidson of assuming that to begin with, now I see that this is wrong. Because I also am assuming in my account even of stimulation at surface, I'm assuming a surface, I'm assuming nerve endings, I'm assuming, as I was aware of , that. And in that, without supposing that the subject even knows about nerve endings. Quine: Well now, similarly, if I liked, and Davidson does like, I could start with rabbits and talk about these stimulations in terms of rabbits without my supposing that he has reified rabbits, and I could still study his gradual reification. So that was the wrong defense. I assumed that I was right early and late in insisting on the surface stimulation. But I couldn't entirely appreciate why. Now I think I do. The problem has nothing to do with not wanting to assume reification in advance, nothing to do with that. The reason is just to have simple, easily comparable units to talk about. When I talk about stimulations, instead of the chaos of outside things, everything is localized. And, so that, it's a question of just what conveniently we can speak of as the cause, what we can speak of conveniently as that to which the observation sentence is conditioned. Quine: And, we can't conveniently say "Well, sometimes rabbits, sometimes cold weather." Well, what's weather? And also, as I pointed out, if we get inside the brain, it turns out that things get rather disorganized, chaotic again, different processes going on. The one place where everything is neatly packaged is at the surface. So those are the reasons. And, I think, the part that you just read now came out of Pursuit of Truth, out of the very place that I've changed. Do you have the page number? Quine: Good. I'll see what I have in manu. Quine: No, but it's supposed to be this fall. I hope early in the fall. Forty-one and forty-two, you say. Quine: Yes, yes. Top of forty-two. There we are. What it used to say, "But my epistemology," this is my crossing out, "But my epistemology permits the subject no such starting point. His reification of rabbits and the like is for me part of the plot, not to be passed over as a part of the setting." And that is exactly the wrong idea now, I think, because it's not a question even of Davidson attributing reification to the subject. So, what I've substituted in place of that I've just read is now this, instead of "But my epistemology" etc., I now have "So I could place the stimulus out where Davidson does without finessing any reification on the subject's part. But I am put off by the vagueness of shared situations." Tomida: So, finally, you'd like to choose the triggering or some surface irritations, right? Quine: Yes. I remember I had difficulty in understanding what his trouble was. And now I've forgotten what the third dogma is. Is the third dogma the idea of a conceptual scheme? Tomida: It is well known that there was a series of discussion between you and Davidson about the purported third dogma or the distinction between scheme and content. According to your article "On the Very Idea of a Third Dogma," Professor Davidson misunderstood your point: he conflated truth and belief, treated surface irritations on a par with "the facts" and "the world," and thus overlooked the proper role of experience of surface irritations as a basis not for truth but for warranted belief. Indeed you have used the term "conceptual scheme" in many places, but I think it is obvious that your use of the term and Davidsonian use are quite different from one another. Of course, we know that you inherited the term "conceptual scheme" as ordinary language through Lawrence J. Henderson from Vilfredo Pareto, and I would like to ask a question on this, Iater, as well, but anyway, the relation between scheme and content which Davidson tried to undermine and the relation between surface irritations and science (or sentences or "conceptual scheme") which you envisage are, in a certain respect, quite different. In his "On the Very Idea of a Conceptual Scheme," Davidson mentioned two different types of relation between scheme and content: the one is expressed as "organizing," "systematizing," "dividing up," and so on; and the other is called "fitting," "predicting," "accounting for," "facing," and the like. Here we must notice that either type of the relation between scheme and content is not that of causation. Tomida: Thank you. Then, I have two other subsidiary questions concerning this problem. The first is: I don't know Vilfredo Pareto well. So, would you explain the conception of "conceptual scheme" which you inherited from him through Lawrence Henderson a little bit? Quine: The only meaning I attached to it is a vague one. Namely, the conceptual scheme would be the more abstract general structure of one's overall theory. Quine: But in fact it would correspond to Carnap's notion of the conceptual framework as opposed to the substitute theory. That would be the difference. But for me that's just a matter of degree. And the notion of conceptual scheme is not for me a technical notion. But it means just the comparatively general aspect of, and would be the comparatively general structure of one's theory. Tomida: I see. I'd like to ask one more question concerning this matter. Tomida: Since your wrote the article "On the Very Idea of a Third Dogma," you wrote it in 1979, I think, maybe, and since you wrote the article, more than a decade have already passed. I know that Donald Davidson mentioned your objection in the "Provenance of the Essays" of his Inquiries into Truth and Interpretation, but he did not show his opinion about it. wonder whether he accepted your objection. Could you tell me about it if you know? Quine: No, I don't. I don't remember my objection clearly enough either. I seem to remember this, that, you correct me if I'm wrong, that in answering I accused Davidson of confusing truth with warranted belief. Quine: But I think that really, if it just weren't for that confusion, that he qualifies as an empiricist too. Quine: No, not that I recall. Although we've had good discussions, of course, we were together there in Spain two years ago, or a year and a half, and again in San Marino, later, and also, of course, St. Louis, and before that. So, good discussions, but no, I don't remember this coming up, and so, it maybe that he has been influenced by my response. Tomida: Maybe, this is my last question. I think that the term "naturalism" is the best key to understand your philosophy, but as you know this term has various subtle nuances. So I would be glad if you talked about your own "naturalism" a little bit. Quine: Well, I wonder. It is certainly a very significant step as far as epistemology is concerned. But on the other hand, it does seem as though it's accepted to a very considerable extent. This naturalistic point of view is shared by all philosophers, by Hume, and a good many others, in fact, the pragmatists, in so far as they have not been concerned to justify science epistemologically. I think that is the place where it seems to me to be crucial. And, so, for that reason, I have not been tempted to think of it as such a revolutionary step, although, certainly, it does make all the difference as far as epistemology is concerned. It simply discards what we think of as the classical fusion of objective epistemology. Anti-Cartesian, that's certainly the crux of it. Rudolf Carnap, Logische Syntax der Sprache (Vienna: Verlag von Julius Springer, 1934), p. 45 (Rudolf Carnap, The Logical Syntax of Language [London: Routledge & Kegan Paul, 1937], p. 52). Rudolf Carnap, "Empiricism, Semantics, and Ontology," in Rudolf Carnap, Meaning and Necessity, 2nd ed. (Chicago: The University of Chicago Press, 1956), p. 214. See W. V. Quine, "Five Milestones of Empiricism," in W. V. Quine, Theories and Things (Cambridge, Mass. : Harvard University Press, 1981), pp. 71-2. Carnap, Logische Syntax der Sprache, p. 246 (Carnap, The Logical Syntax of Language, p. 318). See W. V. Quine, The Time of My Life (Cambridge, Mass. : The MIT Press, 1985), p. 150. W. V. Quine, Word and Object (Cambridge, Mass. : The MIT Press, 1960), pp. 24-5. Robert B. Barrett & Roger F. Gibson (eds. ), Perspectives on Quine (Cambridge, Mass. & Oxford, Basil Blackwell, 1990). W. V. Quine, Pursuit of Truth (Cambridge, Mass. : Harvard University Press, 1990), pp. 41-2. This paper was later published as "In Praise of Observation Sentences," The Journal of Philosophy, Vol. XC, No. 3, 1993: 107-16. Ibid. , p. 114, footnote. See W. V. Quine, Pursuit of Truth, revised ed. (Cambridge Mass. : Harvard University Press, 1992), p. 42. Your visit makes to this W V Quine mirror web page since May 1, 2004 (last updated November 22, 2011).